1999 NIKE Bursary recipient, Christina Arendjelovic, was in her final year in the print stream at the Ryerson School of Journalism in Toronto. Christina spent the summer of 1999 working in the Tennis Canada communications department, a busy and challenging on-the-job experience which she enjoyed as much as Tennis Canada Communicatons Director Steve McAlister confirmed, Tennis Canada was pleased to have her able assistance. Christina spent a hectic summer assisting in the preparation for the 1999 du Maurier Open and working in the high pressure Media Centre during the nine days of the tournament. Christina was always attracted to the media and journalism. 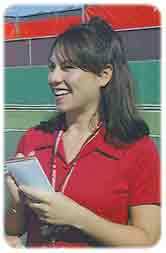 She loved to write and in school was involved in the publication of newsletters and the yearbook. A Brampton resident, she also took on her own high school column for the Bolton-Caledon community newspaper. Christina has always been attracted to movement and activity, and has been involved in teaching ballet to children — and finding the natural linkages to sport and its requirement for a discipline body and the regimen required to perfect physical skills and produce the intended and desired performance.